Directors: Daniel Myrick and Eduardo Sánchez. Cast: Heather Donahue, Michael Williams, Joshua Leonard, Sandra Sánchez. Screenplay: Daniel Myrick and Eduardo Sánchez (with dialogue improvised by the actors). The narrative of The Blair Witch Project begins in relative quiet, builds with exquisite steadiness, and ends with total, profound enervation. The movie itself, made for a very low budget by an unknown cast and crew, has followed a similar trajectory in reaching theaters. What began as just another longshot in the Sundance Film Festival derby is now, however improbably, one of the summer's most highly attended and hotly debated events. The positive buzz that has swelled behind this picture since January gave me no less an expectation than to be frightened out of my mind. Certainly the film delivers, but the film's rare pulse-pounding capability is only one of many achievements by its debut writer-directors, Daniel Myrick and Eduardo Sánchez. I am certain that The Blair Witch Project will prove to be the year's scariest film, but I am equally, thrillingly confident it will also be one of the year's best. The plot is so simple that one believes, erroneously, that its conclusions are foregone. Heather (Heather Donahue) is a student filmmaker who has recruited a cameraman, Josh (Joshua Leonard), and a sound recorder, Michael (Michael Williams) into her project of investigating one small Maryland community's local legend: that the town's woody outskirts are haunted by a murderous witch. When the film team arrives, the citizens of Burkittsvillea name the town adopted when "Blair" became too infamousalternate between skepticism that the filmmakers will find anything and a stone-faced dismay that, if anything is out there, these headstrong kids are just asking to be the next victims. One also senses, however, that the citizens of Burkittsville are flattered that their own local mythology would attract the interest of these out-of-town artists. This subtle gratification at the filmmakers' curiosity interest compels several men and women of Burkittsville to appear before Heather's camcorder and Josh's 16mm lens and share their own private memories and warnings. Only one woman, Mary Brown (Sandra Sánchez), takes the team's questions entirely seriously, but then again the consensus in Burkittsville is that shewho claims to have been visited, caressed, but left unharmed by the Blair Witchlong ago crossed the line into dementia. Heather, Josh, and Michael casually dismiss Mary as a lunatic, even though her haunted testimony is an invaluable asset to their film. By the second day of their planned four-day shoot, they have entered the woods around Burkittsville to seek their own proof: whether anyone or anything out there actually killed five men and tied them, disemboweled, in a gruesome knot, or whether the dead souls of seven children still prance through the leaves and bracken. More than this I will not reveal of the tense, diabolical directions that The Blair Witch Project follows from these opening moments. A caption at the film's outset, however, identifies these images as the students' taped footage, recovered from the woods after Heather, Josh, and Mike disappeared with no other trace. Everything we see in The Blair Witch Project is rendered through one of the team's two cameras, a ghost story in which the filmmakers themselves are the ghosts. But how? What peculiar, unknown edge of the world have they fallen off? Looking at these shaky cameras, and the increasingly anxious trio who holds them, we glean information a small piece at a time. Myrick and Sánchez's ingenious strategy simultaneously builds both suspense and disbelief: how could three people disappear before our very eyes, especially when our "eyes," the two cameras, are specifically on the lookout for any signs of the dangerous, the uncanny? Blair Witch stands like a volcano in the sleepy, stolid chain of its box-office competition. Events in the plot erupt with preternatural force, illuminating with the flame of real originality the paleness of other modern films in the horror genre, or of any genre. Consider the much-celebrated Scream films, proficient shockers that nonetheless wear their virtues and weaknesses in their titles. Scream is an appropriate name for a film in which terror is marked by sudden outbursts, violent instants inserted between obligatory, falsely tense passages of movement and dialogue. Scream 2 is an equally apt title for a film that follows a proven recipe to the letter, or in this case, to the numeral. The Blair Witch Project, on the other hand, knows that real terror lies in lingering uncertainty, a fear of something that remains perpetually unknown. Like the film's characters, its viewers never know if they are in the presence of the killer, or if there is a killer, or if there is merely a shadowy, benign forest where unseen wildlife make tiny noises that echo into louder, larger, more sinister ones. The fear we see on screen may be a reaction to nothing more than cold air, hot tempers, untraceable shufflings, and anxious minds. The key is that none of this matters. What the film dramatizes, and films almost never do this, is the state of being afraid, of being paralyzed by fright; we are immersed for 87 minutes in the unsettling state of wondering if one is going to die, made worse by a confused hysteria over whether the feared attacker even exists. The film has no idle moments, because anything could happen at any time. If the anxiety in the film is exceptional, so is the drama, and not always for reasons directly connected to the witch (or not-witch). At several moments in the film, the students wonder if they are being plagued by rural jokesters with no other diversion than taunting gullible outsiders. Michael, after making a particularly troubling discovery in the woods, rebukes such suspicions by objecting, "No redneck is this creative." At another moment, Josh makes a fretful allusion to the back-country heavies in Deliverance. As in Jonathan Mostow's intriguing Breakdown from 1997, The Blair Witch Project savvily exposes prejudice as another form of fear. Would these kids, or any audience, be so suspicious of local tauntors if they didn't have a low opinion of the community they were amongif they didn't think them capable of such ruthless mind-games? If they didn't imagine them as rubes with no dearer pastime than baiting urban tourists? These unspoken class and regional biases are just one of many seldom-tapped motherlodes through which The Blair Witch Project both intensifies and complicates its plot. The filmmakers also weave an interesting thread of gender conflict through the picture. Both of the women who figure prominently in the story, Heather the director and Mary Brown of Burkittsville, say things of great value but are ignored and derided by those who listen. In fact, Heather herself is Mary's most vocal critic, so the battle-lines are more interesting than stricty men-vs.-women. In a story that revolves around a witch, the only horror archetype usually gendered as female, it is interesting that real-life women also become suspect, even threatening to the people who meet them. 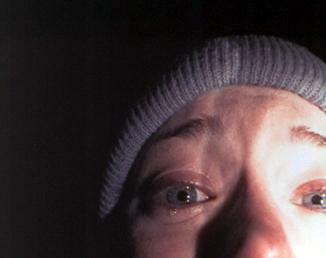 The final and most important reason why The Blair Witch Project is horrifying with almost no gore or visible residue of horror, and why the film as a whole works so brilliantly, is that Myrick and Sánchez are of that increasingly small ilk of filmmakers who understand and utilize the unique capabilities of their medium. They are virtuosos with light, able at one moment to make darkness the scariest thing imaginable, and two scenes later making the presence of light seem unbearable. The soundtrack also plays a crucial role not just in frightening the audience but in developing the three central characters and the forested realm through which they attempt to make their way. The film is not without its flaws and inconsistencies, most particularly on those occasions when the improvising actors behave or speak in a way we do not take as credible. Speaking personally, anger and disorientation would only distract me for so long from finding my way out of a haunted forest, and yet these three sometimes shilly-shally and stall as though waiting for Godot himself to save them from their fate. At other times, the twenty-somethings act as though salvation is theirs if they just say "f***" enough times.